This is another shot from the Sunnyhill Preserve dike trail along the Ocklawaha River. 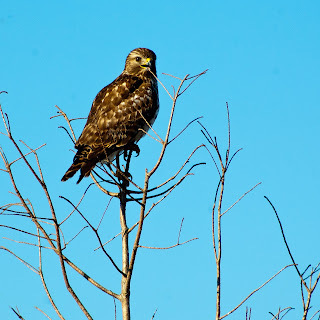 There are a great number of hawks and vultures that occupy the perches along the way. The west side of the river is largely uninhabited with no trails along the waters edge while the east side has a very wide trail along the top of the dike. The water management people do a great job of keeping this trail mowed. There aren't many trees on the east side but they are usually occupied. If you start at the Blue House trailhead off of county road 44 you will find a nice shelter (no facilities) at the 2.5 mile point. It's another 5 miles northward to get to the Moss Bluff dam trail head. I highly recommend this trail for the cooler months. It would be brutal on a hot summer day due to the total absence of shade.